This chapter is about executing TYPO3 core tests locally and is intended to give you a better understanding of testing within TYPO3's core. A full core git checkout comes with everything needed to run tests in TYPO3 as of version 9. We don't use older versions in this chapter since core development is most likely bound to the core master branch - back porting patches to older branches are usually handled by core maintainers and often don't affect other core contributors. Note, the main script Build/Scripts/runTests.sh is relatively new. It works best when executed on a Linux based host but can be run under macOS and Windows with some performance drawbacks on macOS. Additionally, it is possible to execute tests on a local system without using Docker. Depending on which test suite is executed, developers may need to configure their environments to run the desired test. We however learned not too many people actually do that as it can become tricky. This chapter does not talk about test execution outside of Build/Scripts/runTests.sh. Many developers are familiar with Docker. As outlined in the history chapter, test execution needs a well defined, isolated, stable and reliable environment to run tests and also remove the need to manage niche dependencies on your local environment for tests such as "execute functional test "X" using MSSQL with xdebug". Git, docker and docker-compose are all required. For standalone test execution, a local installation of PHP is not required. You can even composer install a core by calling Build/Script/runTests.sh -s composerInstall in a container. If you're using a Mac, install or update Docker to the most recent version using the packaging system of your choice. If you are using Ubuntu Linux 18.04 or higher, everthing should be ok after calling sudo apt-get install git docker docker-compose once. For other Linux distributions including older releases of Ubuntu, users should have a look at the Docker homepage to see how to update to a recent version. It usually involves adding some other package repository and updating / installing using it. Make sure your local user is a member of the docker group, else the script will fail with something like /var/run/docker.sock: connect: permission denied. Windows can rely on WSL to have a decent docker version, too. So what just happened? We cloned a core, composer install`ed dependencies and executed core unit tests. Let's have a look at more some details: runTests.sh is a shell script that figures out which test suite with which options a user wants to execute, does some error handling for broken combinations, writes the file Build/testing-docker/local/.env according to its findings and then executes a couple of docker-compose commands to prepare containers, run tests and stop containers after execution again. A core developer doing this for the first time may notice docker-compose pulling several container images before continuing. These are the dependent images needed to execute certain jobs. For instance the container typo3gmbh/php72 may be fetched. It's definition can be found at TYPO3 GmbH bitbucket. These are the exact same containers Bamboo based testing is executed in. In Bamboo, the combination of Build/bamboo/src/main/java/core/PreMergeSpec.java and Build/testing-docker/bamboo/docker-compose.yml specify what Bamboo executes for patches pushed to the review system. On local testing, this is the combination of Build/Script/runTests.sh, Build/testing-docker/local/.env (created by runTests.sh) and Build/testing-docker/local/docker-compose.yml. Whats impressive is that runTests.sh can do everything locally that Bamboo executes as pre-merge tests at the same time. It's just that the combinations of tests and splitting to different jobs is slightly different, for instance Bamboo does multiple tests in the "integration" test at once that are single "check" suites in runTests.sh. But if a patch is pushed to Bamboo and it complains about something being broken, it is possible to replay and fix the failing suite locally to then push an updated patch and hopefully enable the Bamboo test to pass. lolli@apoc /var/www/local/cms/Web $ echo $? The command asks runTests.sh to execute the "functional" test suite -s functional and to not execute all available tests but only those within typo3/sysext/core/Tests/Functional/Authentication/. The script first starts the containers it needs: Redis, memcached and a MariaDB. All in one network. It then waits until the MariaDB container opens its database port, then starts a PHP 7.2 container and calls phpunit to execute the tests. phpunit executes only one test in this case, that one is green. The containers and networks are then removed again. Note the exit code of runTests.sh (echo $?) is identical to the exit code of the phpunit call: If phpunit reports green, runTests.sh returns 0, and if phpunit is red, the exit code would be non zero. xdebug information to a local IDE and more. As shown there are various combinations available. Just go ahead, read the help output and play around. There are tons of further test suites to try. One interesting detail should be mentioned: runTests.sh uses typo3gmbh/phpXY as main PHP containers. Those are loosely maintained and may be updated. Use the command Build/Scripts/runTests.sh -u to fetch the latest versions of these containers. To speed up test execution, the PHP extension xdebug is not usually loaded. However, to allow debugging tests and system under tests, it is possible to activate xdebug and send debug output to a local IDE. We'll use PhpStorm for this example. 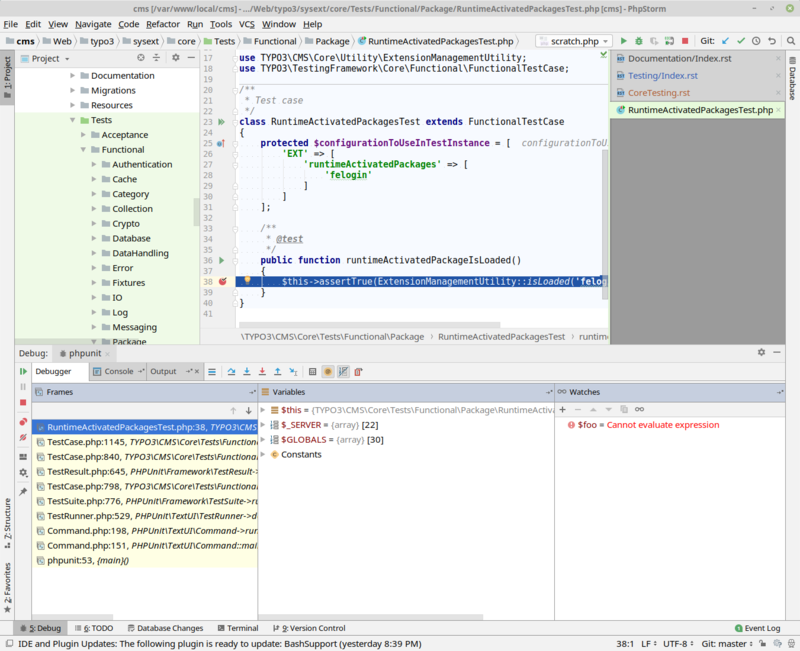 Let's verify our PhpStorm debug settings first. Go to File > Settings > Languages & Frameworks > PHP > Debug. Make sure "Can accept external connections" is enabled, remember the port if it is not the default port(9000) and also raise "Max. simultaneous connections" to two or three. Note remote debugging may impose a security risk since everyone on the network can send debug streams to your host. 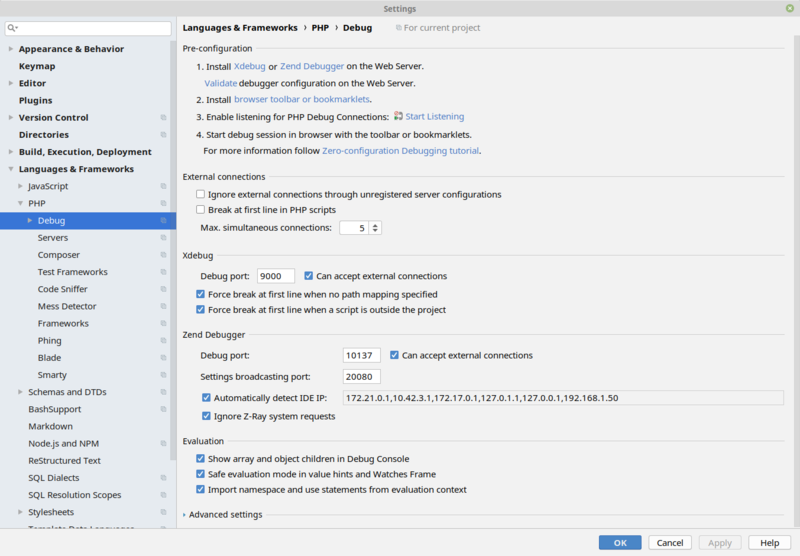 Accept changes and enable "Start listening for PHP connections". If you changed settings, turn them off and on once to read new settings. Now set a break point in an assignment. Note break points do not work "everywhere", for instance not on empty lines and not on array assignments. The best way is to use a straight command. We'll use a simple test file for now, add a breakpoint and then execute this test. If all goes well, PhpStorm stops at this line and opens the debug window. The important flag here is -x! This is available for unit and functional testing. It enables xdebug in the PHP container and sends all debug information to port 9000 of the host system. If a local PhpStorm is listening on a non-default port, a different port can be specified with -y. If PhpStorm does not break as expected, some adjustments in this area may be required. First, make sure "local" debugging works. Set a breakpoint in a local project and see if it works. If it works locally, the container based debugging should also work. Next, make sure a proper break point has been set. Additionally, it may be useful to activate "Break at first line in PHP scripts" in your PhpStorm settings. runTests.sh mounts the local path to the same location within the container, so path mapping is not needed. PhpStorm also comes with a guide how to set up debugging.